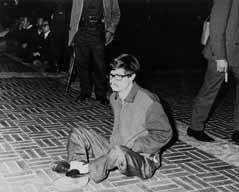 Students occupy a high school of the National University (UNAM) to protest the government's authoritarian rule. For the first time in Mexican history, the army is called in to break up a student demonstration. 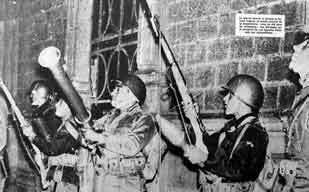 Troops use a bazooka to blast their way into the school. More than 100 students are arrested. 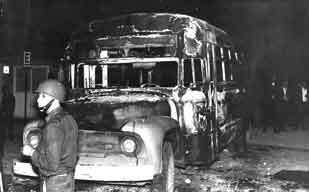 The extreme measures of this day provide the spark for the student movement of 1968. 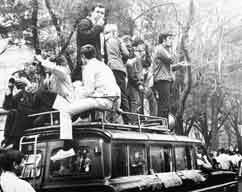 As a response to “El Bazookazo” on July 29th, Javier Barros Sierra, President of the National University (UNAM), leads the first march of the movement. The student-led National Strike Council (CNH) stages the largest protest of the movement. 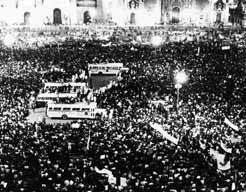 Half a million protestors gather in the main plaza of the capital, El Zocalá, and demand a response from President Gustavo Diáz Ordaz. In his State of the Union address, President Gustavo Diáz Ordaz threatens to use the armed forces to crush the student movement. Video excerpt from documentary Corno Emplumado (2005). Produced by Nicolenca Beltran and Anne Mette W. Nielson. President Gustavo Diáz Ordaz calls the student protesters "troublemakers" and "provocateurs". In response, the students organize La Marcha del Silencio. Over 250,000 people march across the city (from Museo de Antropologia to the main square, el Zocaló) in silence. The army occupies the National Autonomous University of Mexico. Over 500 teachers, students, and on-duty maintenance workers are detained and jailed. The army battles students for over nine hours for control of the National Polytechnic Institute (IPN). Both students and soldiers are killed in the battle. Many more are wounded. 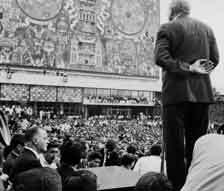 A crowd of 5,000 gathers in Tlatelolco Plaza in defiance of a government ordinance. Army troops take position around the plaza. At around 4 p.m. shots are fired. Seconds later, the military shoots into the crowd and at the residential buildings surrounding the plaza. The shooting lasts more than two hours. Officials announce, "Four Dead, 20 Wounded," but eyewitnesses describe hundreds of bodies trucked away. 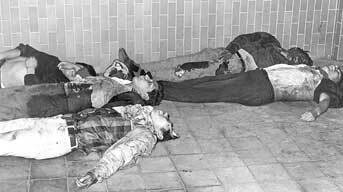 For decades, the government claims that troops opened fire in response to students shooting from the buildings above the plaza. 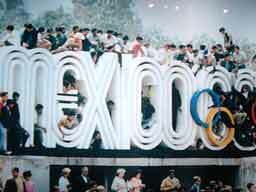 The 1968 Summer Olympics open in Mexico City. The games are inaugurated by President Gustavo Díaz Ordaz at the stadium of the National Autonomous University of Mexico (Estadio Olímpico Universitario).